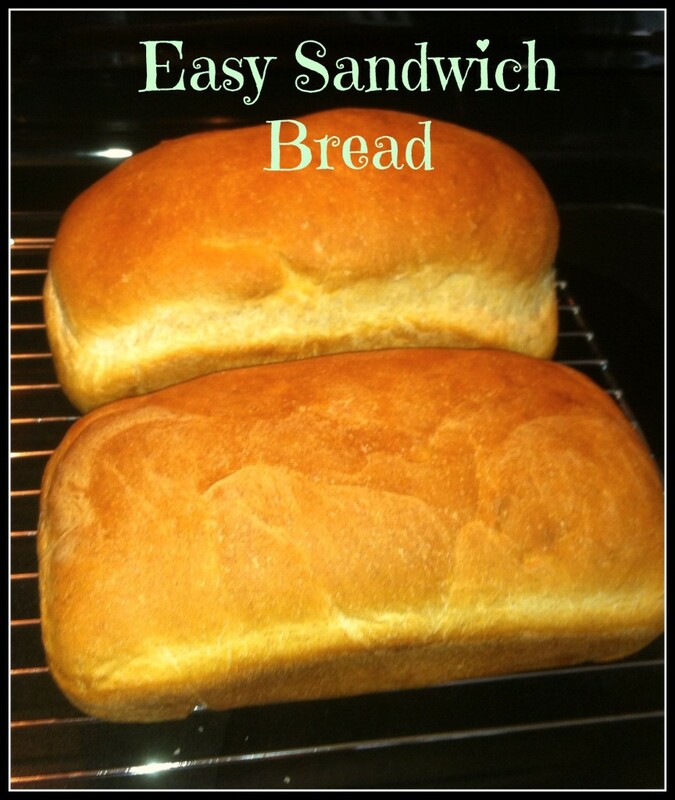 When I decided I was going to make all of our bread, I had to find a good sandwich bread that would hold up to the sandwich toppings and also last a few days on the counter. This is the second recipe that I tried and it has worked out extremely well. 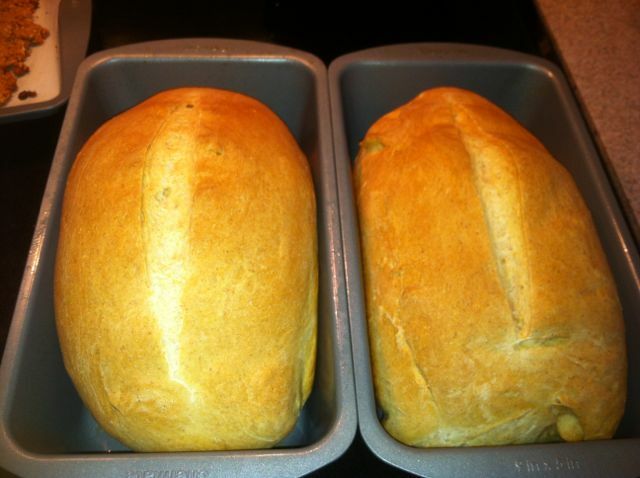 You can either make it with all white flour, or you can substitute in 1 cup of wheat flour to make a white/wheat bread. 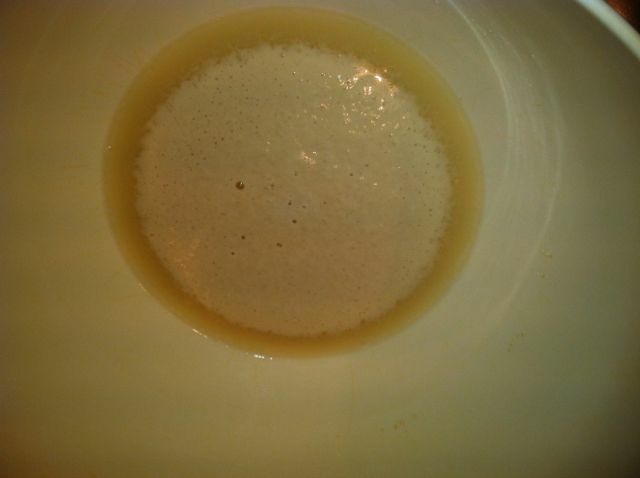 The first thing I do is dissolve the yeast in the warm water. Follow the temperature on your particular yeast to ensure it will be active and not killed. After it sits for about 5 minutes, you should see that it is active and be ready to add the remaining ingredients. I add in my wheat flour first, then add the remaining flour up to 6 cups total. I reserve the 1/2 cup in case I need it. 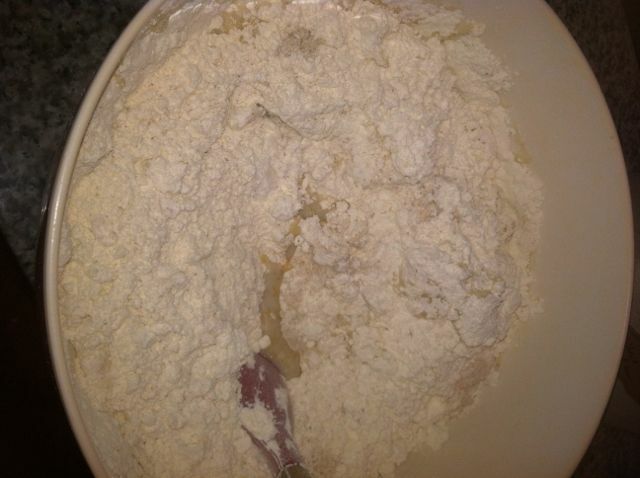 Stir flour until it begins to form a dough. I then switch to my hands and mix it the rest of the way and prepare to kneed. I then cover the bowl and place it towards the back of my stove. 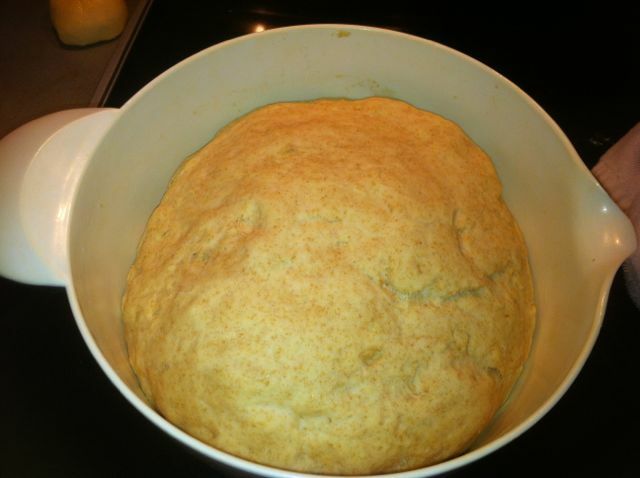 I leave the stove on at 170˚ when the weather is not warm so that I have a warm enough environment for the bread to rise. I let it sit until it has doubled in size. This can take anywhere from 1 to 2 hours. The first time I made this, it took 2 hours. This last time it took a little over an hour. I then turned the dough out, kneed it for a few minutes, and separated into two balls. If I’m having a hard time eyeballing, I will even get down my digital kitchen scale and make sure they are close in weight. I then let the balls rest for 10 minutes. Then it’s time to shape them in to loafs. I am not good yet at making my loaf. I’ve got some work to do there still as you will see in the picture. I then let them rise again until they were near the top of the pan. I have yet to get them to spill over the pan as it states in the recipe. I slashed the top and placed them in the oven to bake away. In 35 minutes I had bread! 2. Melt the butter in the microwave. Stir together the melted butter, milk, sugar, and salt. 3. 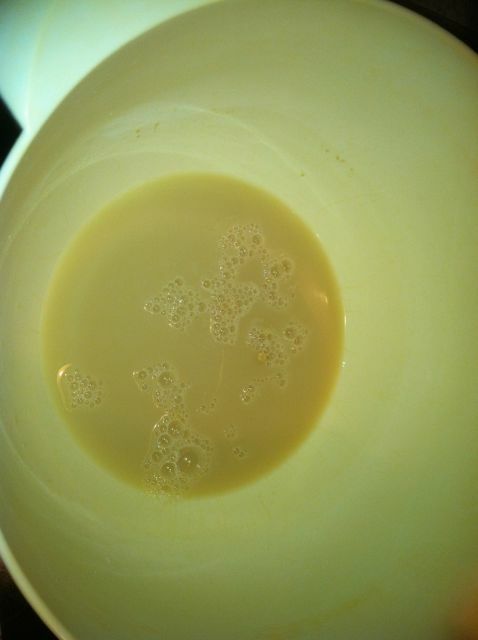 Combine the milk mixture and yeast mixture. 4. Add 1 cup of your flour and stir. Then add remaining flour. 5. Knead for 8-10 minutes against the counter. 7. 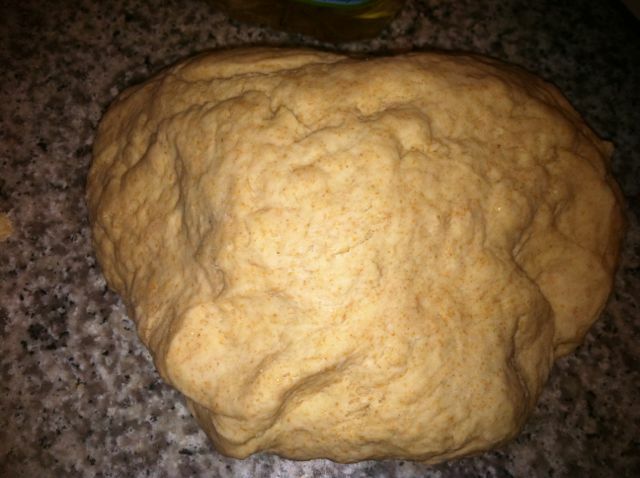 Divide the dough in to two equal parts and roll in to balls. Let the balls rest 10 minutes. 8. Shape the balls in to loaves and place in loaf pans. 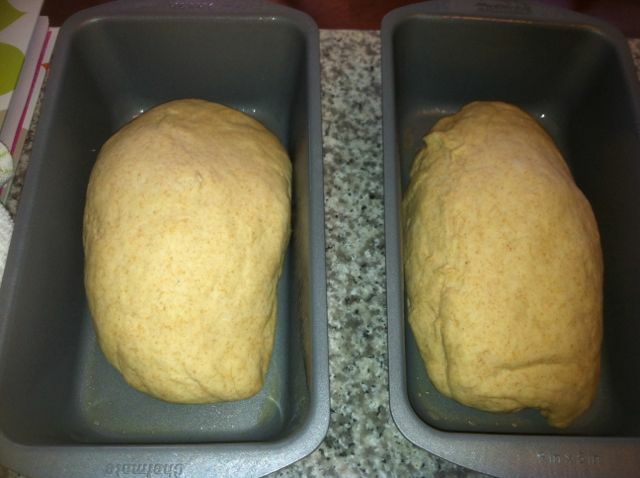 Let the loaves rise again until they dome over the edge of the pan (30 to 40 minutes) 1/2 way through this rise, preheat oven to 425˚. 9. 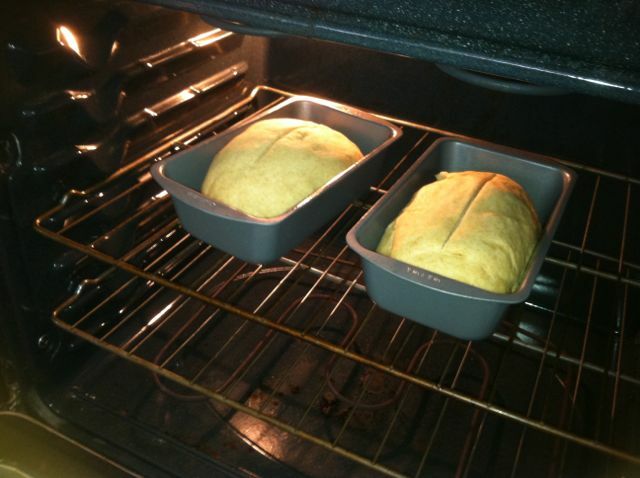 Slash the tops with a serrated knife and put the bread pans in the oven. Lower the temperature to 375˚ and bake 30-35 minutes. 10. Remove from pans and let cool completely prior to slicing. I substitute 1 cup of wheat flour in this recipe. 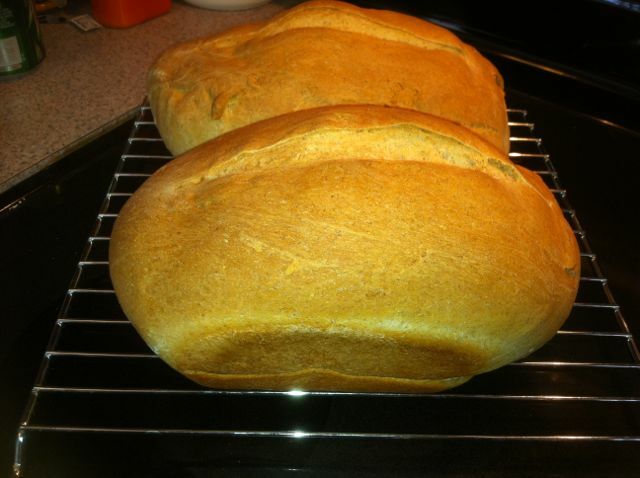 When I use the wheat, I also use 1 tsp Vital Wheat Gluten. I also will freeze one loaf of this bread and pull it out around the middle of the week when we are about to be done with the first loaf. I let it thaw on the counter and then place in a bread bag.